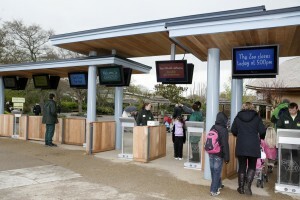 Tourist attractions such as zoos, museums, art galleries, visitor centres and amusement or theme parks are replacing static posters with touch screen TV displays and digital signage information screens to enable smarter and more engaging communication. Aqualite’s range of LCD and LED TV display screens will display live and engaging content to create fully immersive event experiences and can also delivers the ultimate fan experience to keep visitors engaged while increasing revenue. Tourist attractions, theme parks and zoos can attract large crowds. In such a situation where static signs and other sources of information are fighting to be seen and heard, going digital remains the best choice. Aqualite Outdoor’s digital signage solutions allows managers to manage a bank of interactive kiosks, individual digital event displays or video walls and everything in between, all from one platform. No one wants to wait in a 90-minute line, especially when that wait happens for every ride they patronise. One solution for making the guest experience as pleasant as possible while waiting countless hours is to provide inter active, multi media presentations on touch screen display panels. The content options are totally up to the park itself. Content can include anything from music videos to themed trivia, and can easily be altered to entertain the target audience depending on the ride. For example, a children’s ride would be best to play cartoons, which are a great way to entertain the kids and keep the parents happy. Giving guests something to look at gives them a better wait time experience overall. Ad display options are endless with Aqualite Outdoor’s high brightness, all weather TV screens. Think about the many vendors, shops, etc. inside an amusement park: food and drink stands; gift shops, where the ability to display multiple ads and messaegs on one display screen can give the ability to reach many different audiences. You want to be on the top of as many guests’ minds as you can so they will come to your food stand or your gift shop. Digital signage allows for the opportunity to send out as many messages as you please. Incorporating outdoor displays in theme parks offers endless options for displaying content, but it’s important to ensure your electronic display panels works properly and can withsatnd all weather conditions. Outdoor elements create all sorts of problems for electronics, but if you incorporate Aqualite Outdoor’s electronic and digital display screens outdoors you won’t run into problems. Aqualite Outdoor TV display screens are able to withstand wide temperature ranges that come with the seasons, and completely protect the display from rain, wind, dust, etc. All rides have a theme and what better way to immerse guests than by displaying inter active media content on multiple touch screen media displays incorporated in or around the ride? Digital signage can be used to display the rides countdown, or it could be used to simulate or recreate the experience. Updating content has never been easier. Staff can update the content via a computer, eliminating the need to physically change signs and allowing for much more content possibilities. One moment the display could be of an advertisement, while the next it could be playing a movie click to entertain guests.